Alternative Beekeeping are all the non-mainstream methods of beekeeping. The Warre hive, (pronounced war-ray) was really named The People’s Hive. It was developed in the late 1800’s and early 1900’s by an Abbe in Northern France named Emile Warre. Emile wrote a book about this method of beekeeping called "Beekeeping for All". The hive has experienced a resurgence in popularity recently because it’s design and management style promotes natural principles, ease of construction and relatively simple management. 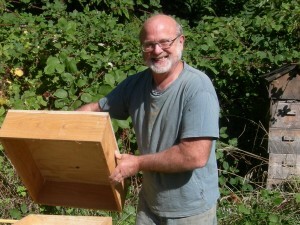 Emile had a simple focus for developing this hive, he wanted Happy Bees and Happy Beekeepers. After experimenting with over 350 different hive designs and methods he produced the Warre, blending the best of both worlds for the bees and the beekeepers. 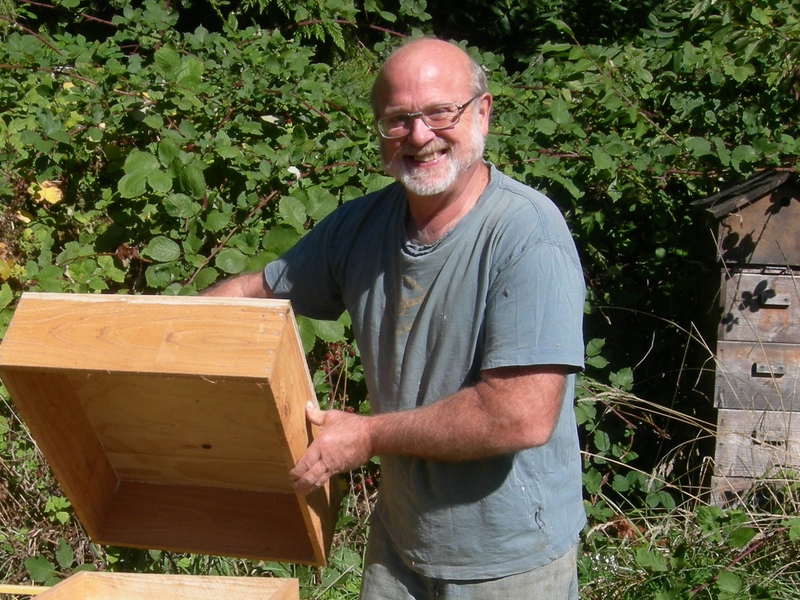 The Happy Beekeeper is the easy part, Emile's hive is easy and inexpensive to build, easy to maintain, and easy to harvest. He wanted a hive and system that appealed to the family farms and homesteaders, because farming and homesteading can be time and labor intense, Emile wanted the Warre to require a minimal level of management to be successfully maintained. It is designed for the bees to behave as they would in the wild. Building their own combs and moving down in the hive on their own as they need more room. It has a similar method as the Top Bar hive in that the Warre has bars also and not frames. It has been referred to as the Vertical Top Bar hive, but that is where the similarities end. The Warre has a unique management style of stacking the boxes from the bottom. As the bees fill a stack of boxes, from the top down, the stack is lifted and an empty box placed on the floor then the stack set down on it. The bees then move down into the next empty box building comb. Again this is very similar to the behavior of wild bees in tree hollows. The happy bees part of the hive is relatively simple also. The hive lets bees be bees, it's design and management emulates the life style and behavior of wild bees in a hollow tree cavity. The bees in a Warre do what bees have done for millions of years in the wild. Emile developed a bit of a hands off management style, feeling the less intrusion into the hive the better. However, modern day beekeeping has some problems that Emile Warre do not have to face. Now we should enter the hive periodically to inspect for the problems facing today's bee colonies. To monitor hive health removing a bar with comb can be done the same as one would with a Top Bar hive. Emile also designed frames for his hive. Any keeper wishing to use their Warre hive with frames can find out how in Emile's book. The framed method does increase the investment, time and labor involved in keeping the bees. The Warre hives tend to have smaller colonies and produce less honey then commercial hives. However since the Warre is normally about 1/3 the size of commercial hives with 1/3 the amount of bees, it is attractive and practical for backyard beekeepers and hobbyists. The Warre isn't as intimidating as a large commercial hive. It also usually produces proportionally less honey then larger Langstroth hives. The honey is ready to harvest in the Fall after the bees have filled 3 boxes or more with comb. It is harvested by removing the top box, reducing the hive down to 2 boxes. Many keepers, such as pollinators, hobbyist and backyard keepers, are willing to except the difference in honey production in exchange for the lower costs and less time spent managing the hive. The best book on the market for keeping Warre hives is "Natural Beekeeping with the Warre Hive-A Manual" by David Heaf. Emile Warre's original book "Beekeeping for All" can also be found on Amazon.